Although no one can control the weather, that does not mean you are out of luck if you were involved in a car accident caused by hydroplaning. Several different options exist for collecting compensation to help with accident-related expenses. Hydroplaning, sometimes called aquaplaning, happens when wet roads cause a driver to lose control. Cars, pickup trucks, motorcycles, and semi-trucks are all at risk. As the vehicle's tires encounter more water than they are equipped to safely scatter, a buildup of pressure in front of the wheels forces water under the tires and makes a thin film separating the tires from the road. The resulting loss of traction makes it almost impossible to brake, steer, or otherwise control the vehicle. Vehicles that hydroplane often starts to spin, increasing the risk of collisions with other cars, road signs, trees, or structures near the side of the road. 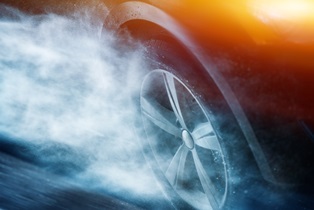 There is a risk of hydroplaning whenever roads are wet, but the risk increases significantly when drivers are traveling at speeds of over 35 miles per hour. To stay safe, it is best to slow down, turn off cruise control, and drive in a lower gear. Take care to avoid sharp turns or sudden braking and try to drive in the tire tracks of the vehicles in front of you. Sticking to your vehicle's recommended maintenance schedule can also help minimize the risk of hydroplaning. Rotate or replace your tires when necessary and check them on a regular basis to make sure they are correctly inflated. Underinflated tires or tires with little tread depth are a common cause of hydroplaning accidents. Other driver: Hydroplaning accidents can be made worse by a tailgating driver. In accidents involving more than one driver who lost control due to hydroplaning, you'd each be found partially at fault. Potentially, you would be able to collect damages minus your assigned percentage of fault. Vehicle owner: If you were driving a vehicle you do not own, the vehicle's owner could be found liable if maintenance issues contributed to the accident. This type of liability might apply in situations where you were borrowing a friend's car or using a vehicle as part of a driver's education class. When your vehicle is owned by your employer and you were driving for work-related business, workers' compensation can provide payment for your expenses. Tire manufacturer: Defective, poorly manufactured, or otherwise unsafe tires are a common cause of hydroplaning. If you can prove your tires caused you to lose control, you can seek damages from the tire manufacturer. Mechanic: When a mechanic makes inappropriate or poor-quality vehicle repairs, he can be held responsible for injuries that result. Agency Responsible for Road: Potholes and cracked or otherwise damaged road surfaces can cause a driver to lose control when a vehicle starts to hydroplane. The government agency responsible for road maintenance can be found liable for damages if poor road conditions were a factor in the accident. Compensation for a hydroplaning accident can include past and future medical expenses as well as lost wages and pain and suffering. However, collecting damages in this type of personal injury claim can be quite difficult. To advocate for your rights, you will need to enlist the services of an experienced personal injury attorney. California law allows up to two years to file a personal injury claim, but beginning your case as soon as possible will ensure that your attorney is best able to collect the necessary supporting evidence. The legal team at Inland Empire Law Group can help you receive the compensation you need to move forward with your life following a hydroplaning accident. Please call today at (888) 694-3529 to schedule a free, no-obligation case review. Appointments are available at our Rancho Cucamonga and Victorville locations.